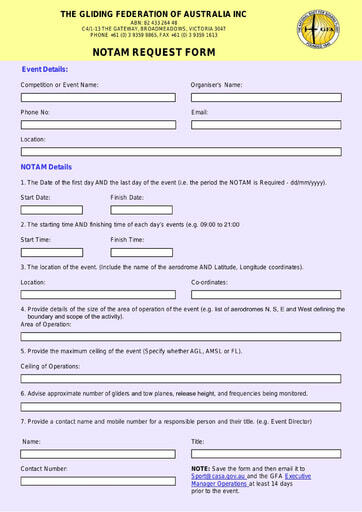 This form is to be used by organisers of approved gliding competitions, regattas or other intensive gliding activities to request CASA to issue a NOTAM. NOTAMS are an effective means of advising pilots of changing circumstances at a particular location, and the time frame, areas and levels that these changes will affect. This form shall be used to notify CASA of the dates and contest area, and must be forwarded at least 14 days in advance to permit NOTAM action to be taken.